San Joaquin County – Caltrans along with local residents and business owners are celebrating the completion of the Mokelumne River Bridge Project on State Route 12 (SR-12).This $14 million project replaced the existing concrete bridge deck, removed and replaced existing electrical components, and increased the vertical clearance of the control house. The bridge, constructed in 1942, is one of only 21 remaining swing-truss bridges in California. The project, slated to take two years to complete, was completed in only one year. Caltrans along with local residents, business owners, Coast Guard and levee districts worked collectively to create a construction schedule that minimized impact to local businesses, residents, and the motoring and marine public. In addition, the hard work by the contractor Myers & Son’s Construction allowed for six full weekend closures of SR-12 to be reduced to only four. The Mokelumne River Bridge Project was one of several projects slated to improve the safety and reliability of SR-12 in San Joaquin County. The $9 million Pavement Rehabilitation and Repair Project will improve a six-mile section of SR-12, from Potato Slough to Flag City is scheduled to be completed December 2015. 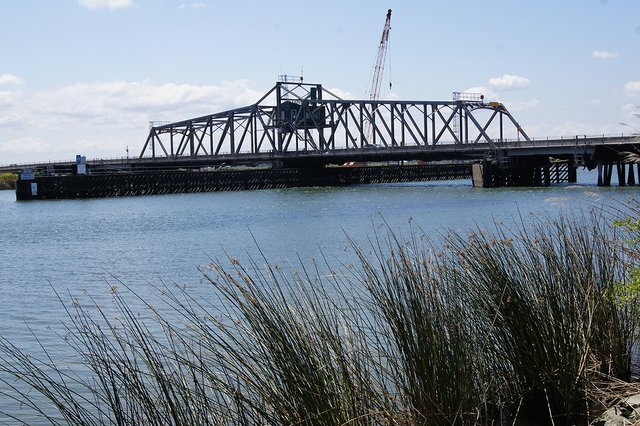 The $47 million Bouldin Island Rehabilitation Project, currently underway, will replace the existing roadway on SR-12 between the Potato Slough Bridge and the Mokelumne River Bridge. The project will improve safety by constructing a concrete median barrier with five-foot inside shoulders and eight-foot outside shoulders with rumble strips. Construction is scheduled to be complete in early summer 2017. I wish they would repair the one in Camp Connell.